Own Smallfoot on Blu-ray™ Combo Pack and DVD on December 11 or Own It Early on Digital on December 4! Burbank, CA, November 13 – Worlds will collide when “Smallfoot” arrives on Blu-ray Combo Pack, DVD and Digital. The film stars Channing Tatum (“21 Jump Street,” “Magic Mike,” “The Hateful Eight”) as the yeti, Migo, and James Corden (“Trolls,” TV’s “The Late Late Show with James Corden”) as the smallfoot, Percy. “Smallfoot” was directed by Karey Kirkpatrick, Annie Award-winning director of “Over the Hedge” and Annie nominee for the “Chicken Run” and “James and the Giant Peach” screenplays. The screenplay for “Smallfoot” was written by Kirkpatrick and Clare Sera, and the screen story was written by John Requa, Glenn Ficarra and Kirkpatrick, based on the book “Yeti Tracks” by Sergio Pablos. The film was produced by Bonne Radford, Glenn Ficarra and John Requa. Nicholas Stoller, Phil Lord, Christopher Miller, Jared Stern, Kirkpatrick, Pablos, Courtenay Valenti and Allison Abbate served as executive producers. Kirkpatrick’s creative team included editor Peter Ettinger, composer Heitor Pereira, co-director Jason Reisig, production designer Ron Kurniawan, and art director Devin Crane. The animation was by Sony Pictures Imageworks. From Warner Bros. Pictures and Warner Animation Group, a Zaftig Films production, “Smallfoot” will be distributed worldwide by Warner Bros. Pictures. “Smallfoot” will be available on Blu-ray Combo Pack and DVD. The Blu-ray Combo Pack features a Blu-ray disc with the film and special features in hi-definition, a DVD with the film in standard definition and a Digital version of the movie. The Blu-ray Combo Pack of “Smallfoot” includes an interactive sing-along that lets viewers follow the words of their favorite songs from the film. “Smallfoot” will also be available on Movies Anywhere. Using the free Movies Anywhere app and website, consumers can access all their eligible movies by connecting their Movies Anywhere account with their participating digital retailer accounts. 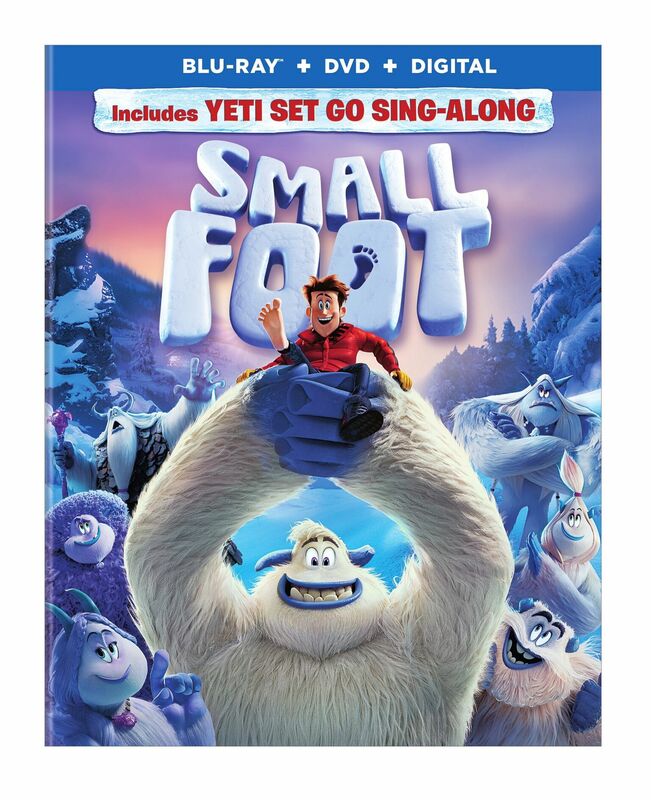 Fans can also own “Smallfoot” via purchase from digital retailers beginning December 4. An animated adventure for all ages, with fun new music by Zendaya & Common and featuring an all-star cast, “Smallfoot” turns the Bigfoot legend upside down when a bright young Yeti (Channing Tatum) finds something he thought didn’t exist—a human! News of the “smallfoot,” Percy (James Corden), throws the simple Yeti community into an uproar over what else might be out there in the big world beyond their snowy village. This is an epic story about friendship and courage! Yeti Set Go Sing-Along – Sing-Along, fun facts and much more! “Super Soozie” Mini Movie – Custom animation featuring the yeti toddler, Soozie. On December 4, “Smallfoot” will be available to own in high definition and standard definition from select digital retailers including Amazon, FandangoNOW, iTunes, PlayStation, Vudu, Xbox and others. On December 11, “Smallfoot” will be made available digitally on Video On Demand services from cable and satellite providers, and on select gaming consoles.